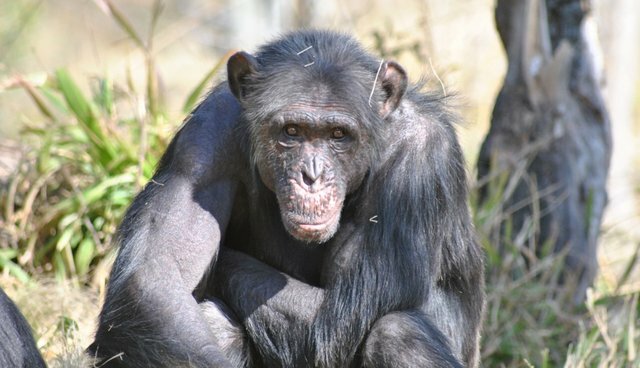 Chimp Wars: What Do We Really Know About Lethal Violence In Chimps? An essay by James Gorman in yesterday's New York Times called "Lethal Violence in Chimps Occurs Naturally, Study Suggests" has resulted in a good number comments and questions arriving in my inbox. These include, "What does the study actually show?" "How robust are the data?" and "What does it mean about the enormous amount of violence in which humans engage?" The title of the essay is catchy and much hangs on the word "suggests," as it should. Observations of chimpanzees (Pan troglodytes) and bonobos (Pan paniscus) provide valuable comparative data for understanding the significance of conspecific killing. Two kinds of hypothesis have been proposed. Lethal violence is sometimes concluded to be the result of adaptive strategies, such that killers ultimately gain fitness benefits by increasing their access to resources such as food or mates. Alternatively, it could be a non-adaptive result of human impacts, such as habitat change or food provisioning. To discriminate between these hypotheses we compiled information from 18 chimpanzee communities and four bonobo communities studied over five decades. Our data include 152 killings (n = 58 observed, 41 inferred, and 53 suspected killings) by chimpanzees in 15 communities and one suspected killing by bonobos. We found that males were the most frequent attackers (92% of participants) and victims (73%); most killings (66%) involved intercommunity attacks; and attackers greatly outnumbered their victims (median 8:1 ratio). Variation in killing rates was unrelated to measures of human impacts. Our results are compatible with previously proposed adaptive explanations for killing by chimpanzees, whereas the human impact hypothesis is not supported. Note that in about 50 years of study, there were only 152 killings with which this study was concerned, 58 (38%) that were observed, 41 (27 percent) that were inferred, and 53 (35 percent) that were suspected. So, 62 percent of the killings were not actually seen. The authors also conclude that human impacts on chimpanzees are not responsible for violent behavior. The Times essay presents different points of view on the study and its conclusions (see this also). I've written about nonhuman violence before, most recently in an essay called "Animals Are Not Warmongers: An Important Media Corrective" in which I wrote on a report by Colin Barras in New Scientist magazine titled "Only known chimp war reveals how societies splinter" (the print edition version is called "Secrets of the only known chimp war"). Despite media often reporting and inferring that many nonhuman animals (animals) are typically violent, this is a misrepresentation of how they really live. Robert Sussman, an anthropologist at Washington University in St. Louis, and his colleagues Paul Garber and Jim Cheverud, reported in 2005 in The American Journal of Physical Anthropology that for many nonhuman primates, more than 90 percent of their social interactions are affiliative rather than competitive or divisive (see cooperation+altriuism">here for an update on what we're learning about cooperation in other animals). Because there's only one known chimpanzee war, a point made by Duke University's Joseph Feldblum who, with a number of colleagues, analyzed this unique event, claiming we inherited our widespread destructive behavior from "them" is not a credible conclusion. Other researchers and I have taken the position, based on available evidence, that claims about widespread violence in animals are misrepresentations and distortions of what we really know about them and we shouldn't be blaming other animals for our violent and evil ways. My earlier essay was titled "Humanlike Violence Is Not Seen In Other Animals" and to be more accurate it should have been called "Humanlike Violence Is Extremely Rare In Other Animals." In this piece I noted among other things, what world renowned primatologist Jane Goodall wrote about violence in wild chimpanzees in her book The Chimpanzees of Gombe: " . . . it is easy to get the impression that chimpanzees are more aggressive than they really are. In actuality, peaceful interactions are far more frequent than aggressive ones; mild threatening gestures are more common than vigorous ones; threats per se occur much more often than fights; and serious, wounding fights are very rare compared to brief, relatively mild ones" (p. 357, my emphasis). Dr. Goodall also noted in 2013 that chimpanzees "have a dark side just as we do. We have less excuse, because we can deliberate, so I believe only we are capable of true calculated evil." The above study authored by thirty prominent researchers is a very important one and understandably has attracted a lot of attention from various media because it raises all sorts of questions about who we are and who "they" (other animals) are. However, more data are badly needed concerning chimpanzee violence and I fear that some people will "pick up the ball and run" with the idea that other animals are routinely violent and that's where we got our evil ways. One of the authors of this study, world renowned primatologist Richard Wrangham who works at Harvard University, maintains that chimpanzee behavior "is a reasonable start for thinking about primitive warfare in small-scale societies." However, he also notes, "I certainly wouldn't want to say that chimps have anything much to say directly about what's going on in Syria." Dr. Sussman claims, "War has nothing to do with what chimpanzees do." As renowned primatologist Frans de Waal reminds us, nature offers many lessons for a kinder society (see this). We need to pay attention to what we know and push aside misleading sensationalist media that misrepresents us and other animals. At best, the jury is still out about the prevalence of intraspecific (within species) violent behavior in chimpanzees and other animals, what causes it, and what it means about our own behavior. So, do animals fight with one another? Yes. Do they routinely engage in cruel, violent, warlike behaviors? No. They're extremely rare when compared with positive prosocial behaviors that benefit others. Thus, we can learn a lot about who we really are from paying attention to what we are learning about the social behavior of other animals and harness our own innate goodness, as some claim it to be, to make the world a better place for all beings.